NincoAir red wing free flight RC conversation with..
Fragrant and delicious looking soapsicles are a great bathroom decoration or tub time treat. 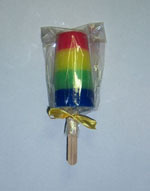 Package a soapsicle nicely and it quickly becomes a sweet little gift. 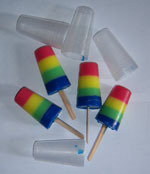 Soapsicles are easy to make and a well picked color combination is all it takes to get a result that almost looks good enough to eat. 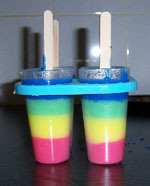 Soapsicles are also a great way to use bits of coloured melt and pour soap that are left over from other projects. You can use a single fragrance concentrate or use a different fragrance for each color for your own unique soapsicle blend. For this project I am using a single fragrance concentrate and 4 basic contrasting colours to give a result that's clearly visible in a photo. To start off this project, first we cut all the soap base in chunks for melting. The chunks of white and clear soap base all go in a single jug to melt together. We're mixing both soap bases because using only white soap gives a light color result while clear soap base allows for creating brighter or darker colors easier but using only clear soap gives a more transparant result. To create a non-transparant looking soap in a dark or brighter color, mix the soap bases to the desired color effect. For this project I've chosen to use a 50/50 mix but if you prefer a softer toned or pastel color combination, use more white soap and less clear soap or even only white soap. If you want brighter or darker colors for your soapsicles, use more clear soap and less white soap. Really dark colors require mostly clear soap with a few bits of white mixed in. 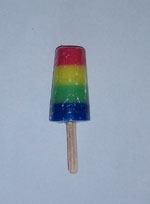 You can also make transparant soapsicles using only clear soap but when using pigment based colors that gives a cloudy, less pretty result. We're using pigment based colors for this project because pigment based colors do not bleed out. That way you can create the layer effect in the soapsicle and be sure that it will keep looking good for a long time to come. To make - partially - transparant soapsicles I recommend using a single water soluable soap color. Make the color lighter, darker or less transparant per layer to create the layering in the soapsicle, perhaps add some cosmetic glitter to a transparent layer to give the soapsicle additional effect. Do NOT use more than 1 water soluable soap color for your soapsicle. Water soluable colors bleed into eachother over time. Your soapsicles would start to look less nice very quickly. Put the jug with the chunks of soap base in the pan of hot water and allow all of the soap base to melt. Stir gently occasionally. Once all of the soap has melted, fragrance the soap with a cosmetic fragrance oil concentrate of your choice. Usually around 15 drops should be enough to give the soap a nice fragrance. If you want your soapsicles to smell stronger, just add a few drops more. 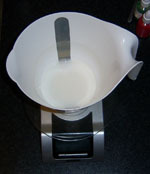 To make the first layer, use the scales to weigh out aproximately 100 grams of the hot soap base into another jug or bowl. Color this 100 gram of hot soap base with the color that you want to use for the first layer of the soapsicle. A few drops of pigment based soap color is usually enough to get a good color result. 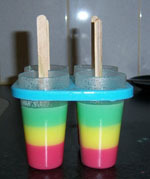 Make sure to use an ice lolly mould that is made from somewhat flexible material. You can try this out by checking if you can gently squeeze the empty mould a little with your fingers. If that's really hard to do, then you might want to consider using a different mould. Once the soapsicles are ready, it will take a bit of effort to get the soapsicle to come loose from the mould. If the mould is made from very rigid material it will be harder to get the soapsicle to come out. For my soapsicles I have used a round ice lolly mould but of course you can do this with differently shaped ice lolly moulds as well. 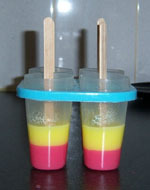 Spray the inside of the ice lolly mould lightly with alcohol and divide the 100 grams of colored soap base equally over all 4 pieces of the ice lolly mould. Try not to touch the side of the ice lolly moulds with the soup when pouring as this would need to be removed to not show in the following layers. Spray the top of the layers gently with alcohol to remove any air bubbles and allow the layers to dry for about 10 minutes. The remaining soap base will have cooled off some by now, so for the next layer of the soapsicle we bring the soap base back to the right temperature (60 to 65C). Repeat the process of weighing out 100 grams in another bowl or jug and give this soap the color that you want to use for the second layer of the soapsicle. Spray the top of the first layer lightly with alcohol to help the layers adhere and divide the second color of soap in equal layers over the first. Spray the top with alcohol again to remove air bubbles. Allow this to set for around 5 minutes. After 5 minutes, when the soap has hardened but not entirely cooled off yet, push the ice lolly sticks gently into the second layer. Leave this to set for another 5 minutes while heating the soap base back up to make layer 3. Repeat the process of weighing out 100 grams in another bowl or jug and give this soap the color that you want to use for the third layer of the soapsicle. Spray alcohol and pour the third layer just like the previous layers. When the third layer has cooled off a little, color the remaining soap base for the last layer. Spray alcohol before and after pouring the soap again, then let the soapsicles cool off completely. Now let the soapsicles rest and cool off completely before trying to take them out of the mould. It's possible to get the soaps out of the mould after an hour or 2 but I would recommend letting the soapsicles harden for at least several hours more before trying because it will make it easier to get the soapsicles to release from the mould. To get the soapsicles out of the mould, gently manipulate the plastic of the mould to let air in on the sides of the soap. Gently wiggle the soap by the stick to get the soapsicle to release from the mould. Don't be worried if the soapsicle won't release straight away. Have patience when wiggling it loose and in a minute or 2, your soapsicle will release. Don't try to use force to pull out the soapsicle by the stick. You'll end up pulling the stick out of the soap, leaving the soap stuck in the mould. Before adding a decorative packaging, it's recommendable to package the soap in shrinkwrap. To do this, roll the soapsicle tightly in shrinkwrap, trim the top and bottom to fit, then use a crafting heatgun to shrink the plastic around the top, sides and bottom of the soap. This will help to preserve your soapsicle for many months. To nicely package the soapsicle, put a cellophane bag over the soapsicle, trim it to the right size and tie it shut with a satin ribbon. Your soapsicles are now all done.